Babies get fussy. There’s no way around it, and it’s something all new parents have to accept and deal with. Particularly, most babies tend to get fussy around the hours of 5-10PM: a time period lovingly referred to as baby’s “witching hour.” In European folklore, the witching hour is the time of the day when demons, monsters and all sorts of horrifying supernatural creatures are at their most powerful and wicked. Scary stuff, huh? Some people call it the baby’s “arsenic hour”, which sounds equally horrifying. The worst thing is that the term “witching hour” is misleading… this period often lasts 3-4 hours or more at a time! Have I scared you enough yet? I didn’t mean to, honest. If you are scared, you should be happy to know that there are some ways to cope with this trying period of time. A little witchery of your own, perhaps! What Causes The Witching Hour? I’m sorry to tell you, but there really are no known causes for it. Colic is often to blame; this is a tummy and intestinal trouble that is thought to be caused by gas. The main culprit is baby bottles, so a good first step is to get some bottles made specifically for gassy babies. Overtiredness: Babies sometimes have a hard time developing a good sleep pattern, and over time that sleep debt will build up until they’re actually pretty miserable. Read our tips on how to sooth an overtired baby which might help. 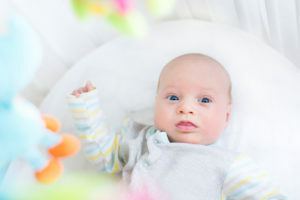 Overstimulation: Babies can easily become overstimulated due to all of the sights and sounds around them, and this is even more aggressive during the day! While your baby isn’t necessarily taking part in all of the action, it still has an effect on her, which in turn can cause fussiness. Unfortunately, it’s going to happen no matter what. There’s no way to avoid it and no matter how hard you hope and pray, you’re going to find yourself awake at ungodly hours of the night with your little one. It’s not going to be easy, but if you’re prepared for it, it helps. Thankfully, it’s not going to be a problem forever. With luck, it will only be a short and small part of you and your child’s life, and then you can move on from it. I recommend being prepared for it. Assume that your baby is going to be wailing their little lungs out at 3AM and plan accordingly. If you think you’ll be able to watch a movie over the noise, try to do so. If the weather’s nice, maybe you could plan on taking them out in a carrier for a nice walk. It sometimes helps. Some people will tell you not to ever comfort feed, but really, it’s okay. You’re not going to fall into a bad habit trap or anything like that, and sometimes all they really need is a full belly to relax and stop being so fussy. A bottle or breastfeeding can be a great cure, or at least make things a little better. In any case, try it. During this often-trying time, it’s easy to blame yourself for all of the madness. You need to remember that this happens to most babies, and there’s often no way to prevent it from happening in the first place. It’s not a failure of yours as a parent. There are thousands of other parents going through the exact same thing as you are! Take turns with your partner in dealing with the witching hour. Sometimes it’s best to take a step outside for 5 or 10 minutes to regain your cool and help cope with it. It can be draining, and switching out really helps. If you can, sometimes asking for help from friends or family is a good idea. Try that too! White noise has an amazing calming effect on many troubled tots. Get a white noise machine (they’re cheap) and try it out; you might be surprised at how well it works. Something like a fan running in the room (but not pointed in the direction of your child) can also work as a white noise maker, too. A warm, soothing bath can sometimes be just what the doctor ordered, and that goes for both baby and parent. Set the lights low and maybe play some soothing music in the background. Shut the door and try to make the room as relaxing as possible. Get in and have a nice bath together, and it might just do the trick. Overstimulation could be the cause of all the fussiness, so do everything you can to get rid of any external stimuli. Unplug the phone (or put it on silent) and make sure there aren’t going to be any other loud noises, like barking dogs or slamming doors. Sometimes experimenting is the way to go; all babies are different and some things will just work better for some than others! Try different things like laying them down straight, burping them, different toys and stuff. With any luck, you’ll find something that helps! Do you have any experience or tips that might help other parents with their baby’s witching hour? Let us know in the comments section below!